I am closing in on attempting some Dredd'verse designs for C3G. I thought I would throw some feelers out and see what Dredd Heads want in 'scape versions of their heroes. 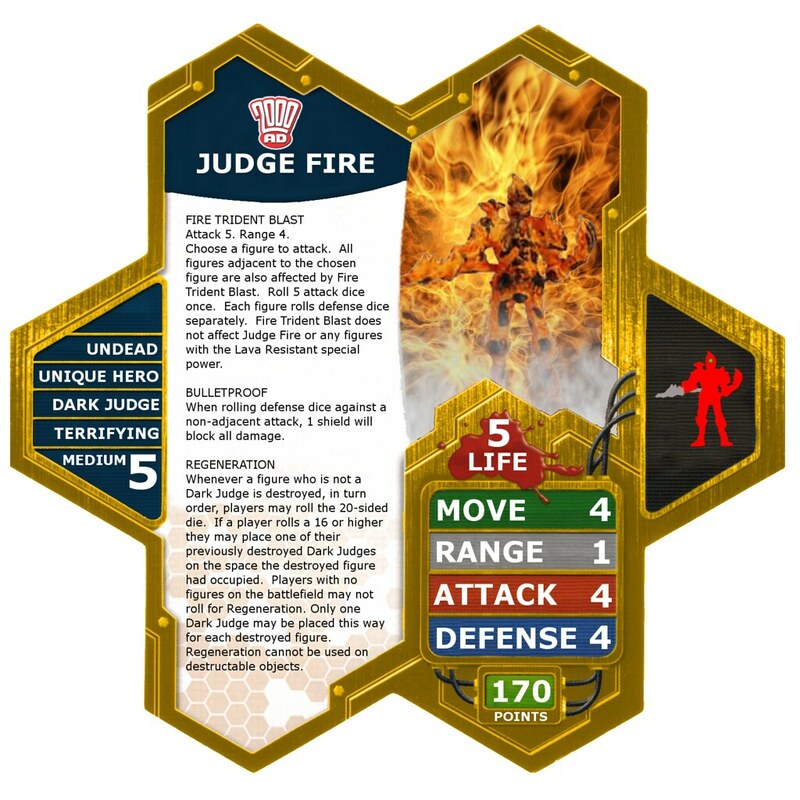 Right now Heroclix has figures for Judges Dredd, Anderson, Hershey, and a generic Brit City Judge. They also have all four Dark Judges. What I am looking for is fans and interested 'scapers to voice their wants and opinions for these characters. So let me know if you love Dredd and what you want in Dredd designs. Soon I will start posting ideas for these designs so everyone can voice their opinions. I look forward to hearing what everyone has to say. Also, for Indy heroes I have worked on Nemesis, Torquemada, Johnny Alpha, and Wulf Sternhammer. If anyone is familiar or interested in these designs please let me know. Thanks in advance. I am attempting to generate some Indy interest in comic designs. Last edited by Tornado; April 5th, 2014 at 08:33 AM. All right, there is one! I think the Judges are going to have a Lawgiver Special Attack with three different 'bullets'. Lawgiver is a tough one since it fires at least a half dozen different rounds and would be impossible to represent that on a C3G card. So I will need to find a happy compromise. 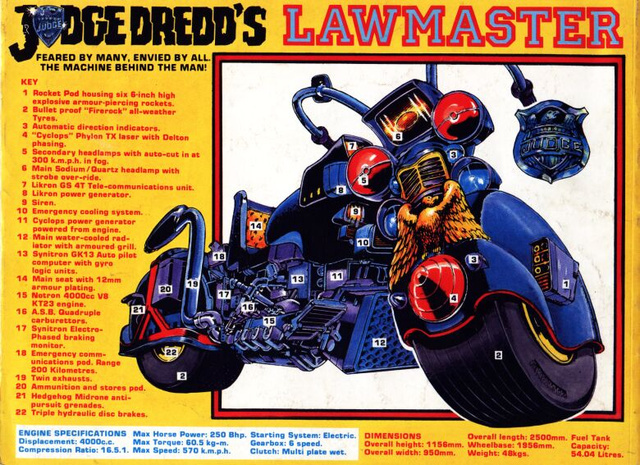 Judge Dredd may attack any or all adjacent criminal figures with a normal attack. For Anderson I was thinking something like a Mind Blast Special Attack or possibly something that negates other Telepaths powers (she did this against the clone of the Judge Child). I also considered giving her some sort of bonding. Judge Hershey will have something like Gordon's Call for Backup except for Judges instead of Lawmen. I think the Brit City Judge might make a good uncommon hero, perhaps a Rookie Judge. I am also considering Judge Giant for that mini. I'm liking what ya have so far. The vision you have for the "Judges" Faction sure seems like they will be fun. I especially like: Lawgiver with the bullet points for different types of shot. Judge Hershey with his Call for Backup like ability to help tie the Faction together. I'd polish the Judge Dredd first, as it will probably be your best bet to get into C3G first, as he is a more well known character, then push for a second judge, like an Anderson or Hershey. The generic Brit City Judges, I agree make them uncommon/common, and give them some kind of ability that helps out the more famous Judges, maybe some kind of bonding, or wound soak. Definitely the potatoes to the meat of the Unique Judges, if ya get my metaphor. I have a CASE of IndyClix (48 packs) I got for sale for $24 with about 5+ of most figures and I would love to use them. 1/2 of them are from Judge Dredd, so that set would be awesome. That might be difficult. I can not see any of the veteran Judges not having a Lawgiver Special Attack. The Lawgiver is the primary weapon of all Judges and extremely iconic. It might work for the uncommon Judges but I am at a lost as to what powers to give them. Some kind of movement bonding would be great and as mentioned above a wound soak power like the 5th Street Cops. Thanks again for all the input. Keep those suggestions coming and Margloth you must read some Dredd. Oh bonus note, they are making a new Dredd movie and they promise that 'ol' stoney face' will not be removing his helmet. I hate to over-complicate things, but I think the Lawgiver needs to be an E-Glyph in order to make room for different judges to have different powers. Also, if a non-Judge uses a Lawgiver, it'll explode in his face. It could make a great combo with mind control powers. I was working on cards for all 4 dark judges and the lawgiver glyph a while back. Do you want me to dig them out and post them here for you to disect? I've recently read the first 10 years of Judge Dredd strips so I could help you with theme questions. Karl Urban as Dredd in the new film looks awesome. He played Dr. McCoy in Star Trek (2009). And he said he wouldn't be interested in the role if they asked him to take his helmet off. Consumate professional! OK, I found my old dark judges designs. They needed a few tweaks, but I think they're reasonable now. Feel free to chop 'em up and rehash. Start the game with a [color] Judgement Marker for each [Name of this unit] you control. 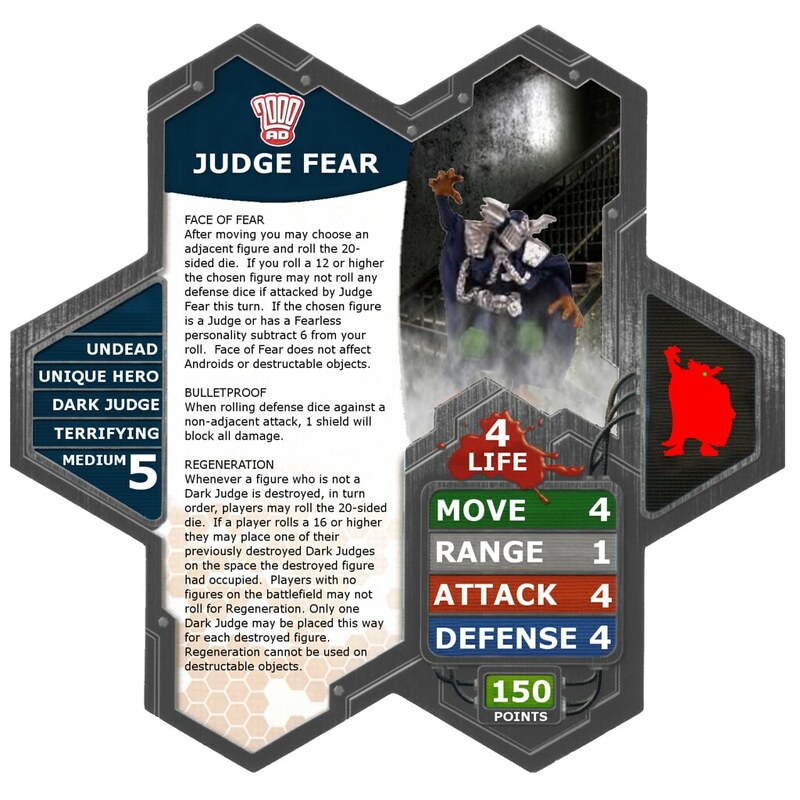 If an opponent's figure within clear sight of this Judge inflicts a wound on an opponent's figure, you may place a Judgement Marker on that figure's Army Card. Before attacking, you may roll a combat die. If you roll a skull, you may roll an additional combat die. You may continue to roll a combat die in this manner until you do not roll a skull. 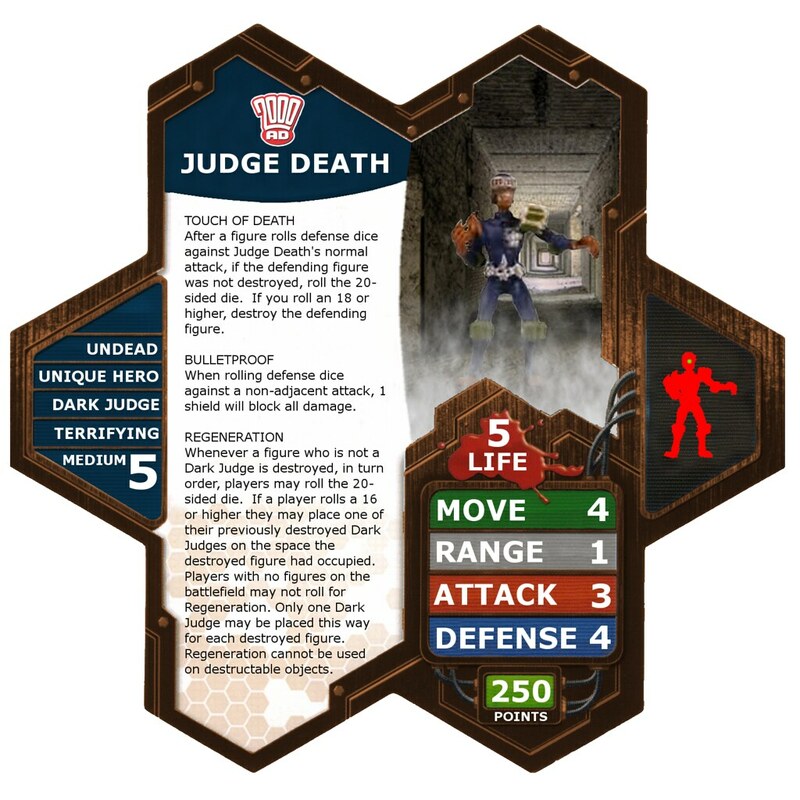 When attacking with this Judge, you may roll an additional attack die for each skull rolled with Jury. When attacking an opponent's figure with a Judgement Marker on its Army Card, instead of rolling an additional attack die for each skull rolled with the Jury special power, you may add an automatic skull for each skull rolled with the Jury special power. Probably overly complicated, but I see them being relatively weak unless they witness a crime (Judge), consider the action to be taken (Jury), and if they decide the figure is guilty, put him down (Executioner). But I may be way off. Awesomesauce gentlemen. That is an interesting take on the (Rookie?) Judges Margloth. I did consider making them Lawmen but they are more than that. Like your powers state, they are judge, jury, and if need be executioner. That can be ironed out in time. Big thanks streaky. Dredd is my second favorite character and I have been reading the comics since the 80s (still have my Dredd T-Shirt from 89). I am going to need others like you to help me keep true to the Dredd theme. I am looking forward to lots of input from you! I absolutely agree that the Lawgiver should be an E-glyph that explodes if a non-judge uses it (this is exactly what I had in mind). Unfortunately the C3G heroes shot it down with an armor piercing round and blew it to bits. They do not allow an E-Glyph with a special attack. So I am forced to design within their parameters. The best bet is a Special Attack with three bullet points, allowing for three different settings/ammo. Thanks and more thanks on the Dark Judges. I have been creating them over and over again in my mind and keep hitting walls. Here are some thoughts of mine on what they should have for powers. #1 Special power/attack unique to each DJ. Pretty much like what you have for your DJs. I am considering giving Fear a static power that prevents adjacent figures from revealing OMs. #2 Toughness. You covered it with bulletproof, which I like, but I am thinking I may just give them high Defense and low Life. #3 Regeneration. They always seem to find a way to come back. Usually though it takes some time to prepare a body for possession. I was thinking one way to go would be close to what you have but a DJ must destroy a figure to bring back another Dark Judge. #4 Teleportation. They terrorized Mega-City One with their teleportation devices when they came back the second(third?) time. They would 'port into an area, kill as many as they can and when the Judges show up, take a few bullets, laugh, teleport to a new location and repeat. For this I was thinking that at the end of each round all DJs can teleport anywhere on the board (perhaps requiring that they must be placed adjacent). I am also considering letting them remove a wound marker or two after teleporting. Not exactly true to theme but it would roll teleport and regeneration into one power. Also any DJ with two or more wound markers, would not be able to teleport/heal. #5 Bonding. These killers are a pack and attack together. I have a couple ideas here like "After taking a turn with a DJ you may take a turn with another DJ" or giving Death a Prof. X like power that allows him to instead of taking a turn himself that two other DJs can take a turn. Another one would be something like if you have all of your OMs on DJS then you get a bonus turn with the Judge that has the X OM. #6 Telepath vulnerability. Judge Anderson and her psi-powers proved to be the nemesis of the Dark Judges over and over again. Maybe this weakness can be squeezed in at the end of another power. A lot of possibilities here and a max of three powers per card. Hey streaky, any chance you are familiar with other 2000AD heroes? I have designs for Torquemada, Nemesis, Johnny Alpha, and Wulf Sternhammer. I could use some input from people who have read these comics on my designs. I absolutely agree that the Lawgiver should be an E-glyph that explodes if a non-judge uses it (this is exactly what I had in mind). Unfortunately the C3G heroes shot it down with an armor piercing round and blew it to bits. They do not allow an E-Glyph with a special attack. So I am forced to design within their parameters. Any reasons given as to why that whole aspect of design has been forbidden? Your ideas for the dark judges are amazing! I hope you get a chance to do them proud with all those suggestions you made.